Life lately has consisted of lots of early mornings thanks to my 20 month old who won’t sleep in past six am! To think I used to wake up at five every morning to exercise boggles me. The thought actually makes me a little nauseous. And I looked forward to it? What happened to that girl? One thing I do look forward to when I wake up that early now is breakfast. I’m back on my green smoothie kick and this Strawberry Banana Green Sunrise Smoothie is one I love. I shared this recipe over at I Heart Nap Time last year when I was a contributor and I’ve kind of been itching to share it with you because it’s a fav. It’s so simple and combines two of my favorites- strawberries and bananas. Freshly squeezed orange juice makes it the perfect “sunrise” smoothie. You know, since we are up at the crack of dawn. 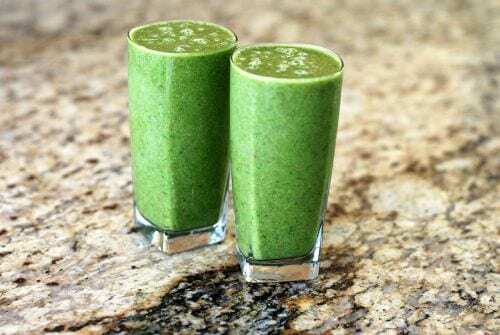 a delicious and healthy green smoothie to start your morning with! Place everything in a blender (in the order listed) and blend until smooth and creamy! Sweeten with agave if desired. This recipe was first published over at I Heart Nap Time, a recipe I created as a part of the I Heart Nap Time Creative Team, 2013. 6 am is super earlier! Thank goodness for this smoothie! I’m always on the lookout for a good smoothie recipe. For sure trying this one, Kristy!